Raw sushi… wait, isn’t sushi raw anyways? A dude at my farmer’s market sold me some parsnips and told me they make great raw sushi. I had to think about it. I don’t make a lot of raw food except for salads, guacamole and salsa. This is one of the reasons I’m fascinated by Melissa’s raw cheesecake. I’m a little lazy so I skipped Stan’s advice (my farmer’s market friend). He told me to chop these roots coarsely. 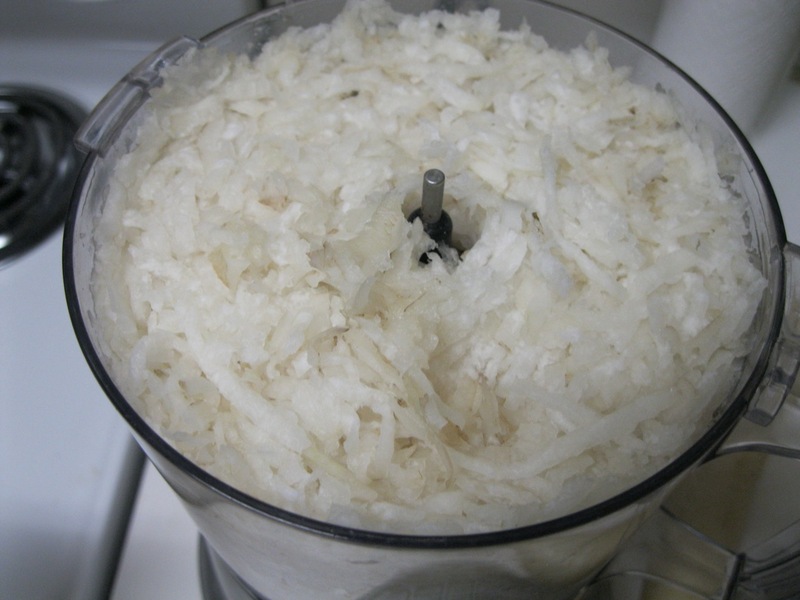 I put two of them into my food processor with the shredding blade. They’re pretty big, I’m not even sure they’re really parsnips since the ones I grew up with were small, pointy and a little sweet and these weren’t so much. Who knows. I’m not a rocket scientist. They worked fine for what I was using them for. I suspect cauliflower would work well too. 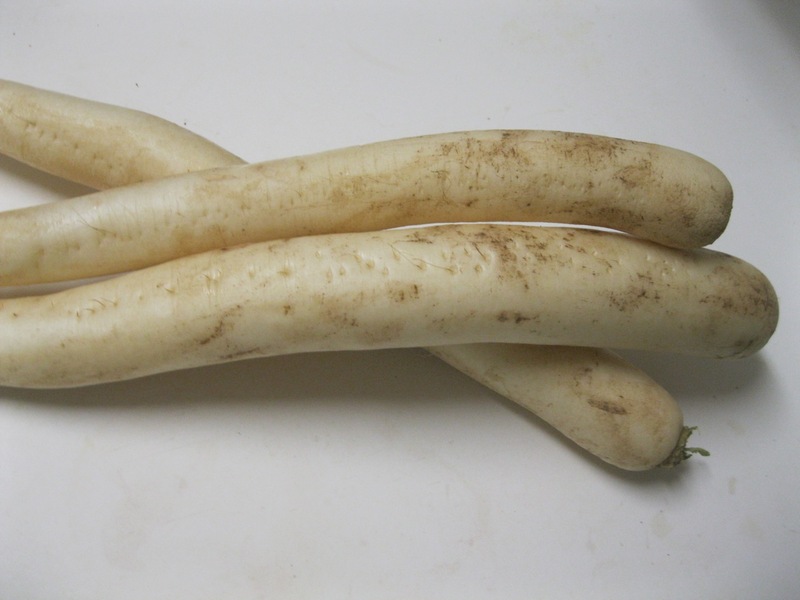 I showed the picture to my cousin who is a real farmer and he suggested that they might be a kind of Japanese radish called “Daikon”. Wow, he’s smart. The flavor of the plain root was crisp and clean with a very mild spice. This recipe is loaded with fiber, vitamin A, C, E, omega fatty acids, and essential amino acids to name a few. It’s low in fat, has no cholesterol, no hormones, and no synthetic antibiotics. I dumped this into a large bowl, added a tablespoon of tahini, half a teaspoon of maple syrup (if you use parsnip, you probably won’t have to add a sweetener), a dash of ponzu sauce and a few dashes of rice wine vinegar. I mixed it with my hands… if you’ve got little kids I bet they’d like that part. I tasted it until it was slightly sweet and slightly salty and with just a hint of tartness, like regular sushi rice. 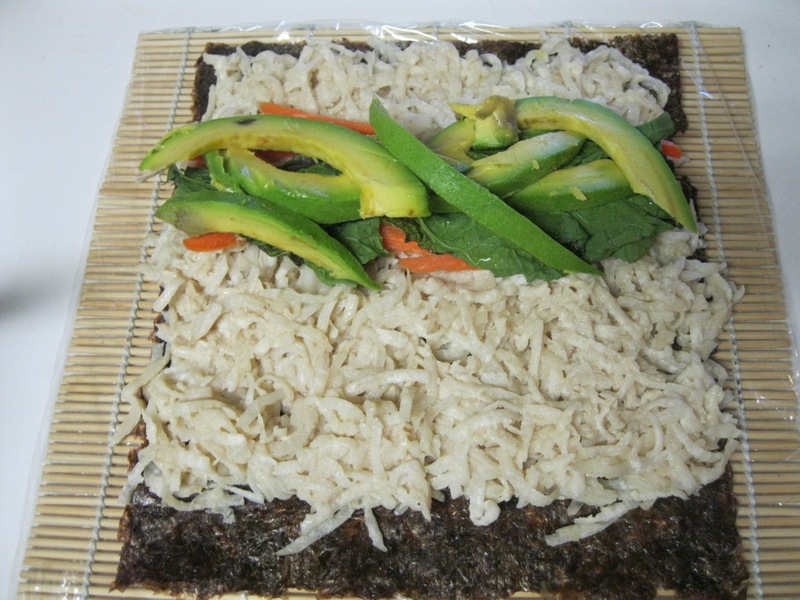 After that, I spread out about 3/4 cup onto a sheet of nori and added the fillings. In this case – carrot, mustard greens (stems removed) and avocado. I used moisture from the bottom of the “rice” bowl to seal the edges. The first roll of these fell apart while I was trying to cut it. 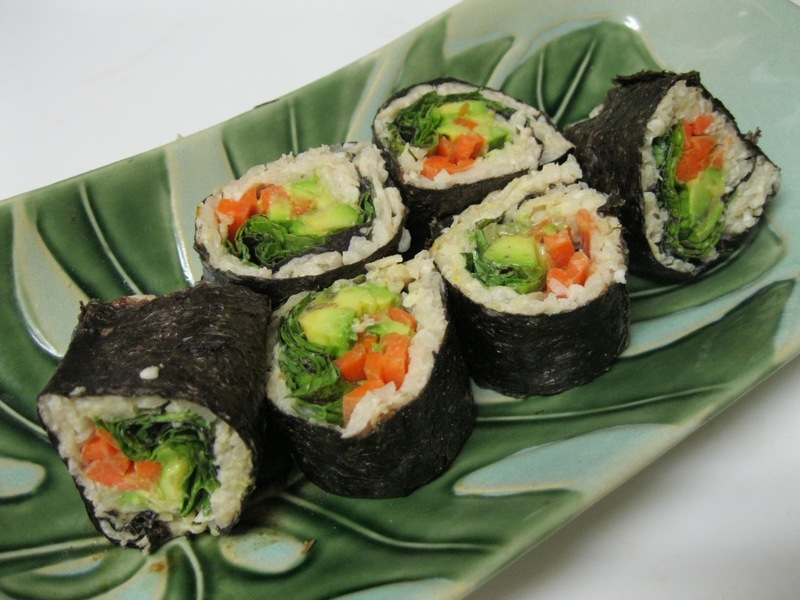 I started wrapping them up in 2 sheets of nori. I realize my rice was too wet. By the third try, they were pretty enough to get a picture. They took very little time to prepare: no waiting for things to heat or cook. They were also exquisitely tasty with soy sauce. This is Christie, signing off… to attack that last “parsnip”. JEN! I’m so glad you’re checking out our shiznit!!! I still have to try that recipe you gave me for apple cider donut pancakes. It’ll require some substitutions for eggs, butter and milk but I anticipate AWESOMESAUCE. Also… these cookies look incredible. I’ll probably drizzle chocolate over those and the pancakes. I’m too predictable.